Surface contamination of fruits & vegetables is a problem for growers, distributors and retailers. Mold and bacteria can have severe effects causing produce to spoil. 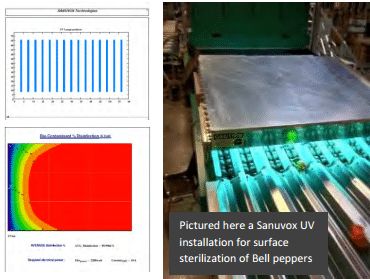 FoodSafe UV Sterilizers are exceptionally safe & versatile disinfection systems for surface, packaging & conveyor applications designed to bask meat, fish & poultry, fruits & vegetables, baked goods and packaging with UVC germicidal light. The UV system is extremely effective at destroying surface contamination while extending product shelf-life. Only a few seconds of exposure can achieve up to 99.999% destruction of common biological contaminants that are problematic in the food industry. EQUIPMENT: FoodSafe IL units in various widths, equipped with parabolic reflectors and Teflon coated lamps will be positioned equidistant across the conveyer, parallel to the conveyor. Computerized sizing programs taking into account the speed of the conveyer and the contaminant(s) to be treated will determine the size of the lamps. the conveyer guaranteeing there is no direct UV exposure to employees. Fruits and/or vegetables will be exposed for a predetermined period of time to UV radiation as they move through the enclosure on the conveyor. This predetermined time will be sufficient to sterilize the fruit and/or vegetable pathogens and slow down ripening process. Researchers from the Department of Food, Science and Nutrition (Laval University, Quebec, Canada) demonstrated that exposing strawberries to ultraviolet radiation prolongs their shelf life. Freshly picked strawberries exposed to Germicidal Ultraviolet Irradiation (UV-C) have retained their freshness for 14 to 15 days, while untreated freshly picked strawberries were “almost done” on the tenth day. The conclusions from this research have been published in the Food Science Journal. Refrigeration, which slows the growth of microorganisms and fruit ripening, allows a limited but effective mean regarding conservation of strawberries. “Exposure to UV-C is a very interesting approach to facilitate the marketing and distribution of fresh fruits and vegetables”,says researcher Joseph Arul. This treatment slows the ripening of strawberries: they remain firm longer, their respiratory rate is lower, their color is more attractive and the taste is not altered. “It is believed that exposure to UV-C would kill some mold on the surface of the fruit or, more likely, the treatment would stimulate the defense mechanisms of the produce,” suggests the researcher. Arul’s team has already demonstrated the benefits of UV-C exposure for the conservation of carrots, broccoli, tomatoes and blueberries.